Gnomon School of Visual Effects has announced Becoming a World-Class Animator, a free event hosted by veteran animation director Marco Marenghi at its Hollywood campus on Thursday 17 September. Currently senior animator at EA DICE, Marenghi originally trained as an electronics engineer, but switched careers after a forced redundancy gave him space to re-evaluate his life. He went on to work as animation supervisor at Sony Pictures Imageworks on movies like Alice in Wonderland and Green Lantern, and was animation director at Animal Logic on Walking With Dinosaurs 3D. In his presentation, Marenghi will draw on his own career history to discuss lessons in dealing with rejection, and share advice on how to stay motivated in the competitive animation industry. During the session, Marenghi will also reveal what he looks for in aspiring animators and how to make your reel stand out from the crowd. 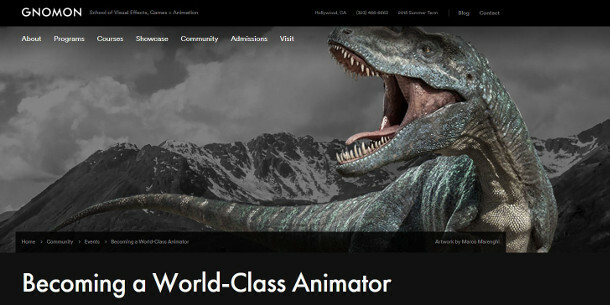 Becoming a World-Class Animator runs from 7-9pm at the Gnomon School of Visual Effects on Thursday 17 September. Entry is free, but seating is first come, first served, and you need to register in advance online. If you can’t make it to LA in person, the event will also be broadcast free on Gnomon’s livestream.